Microsoft is hoping an information overload will help Bing provide a better image search experience. The software giant has updated this function to present a bevy of useful and related information without having to dig deeper or adjust search parameters. 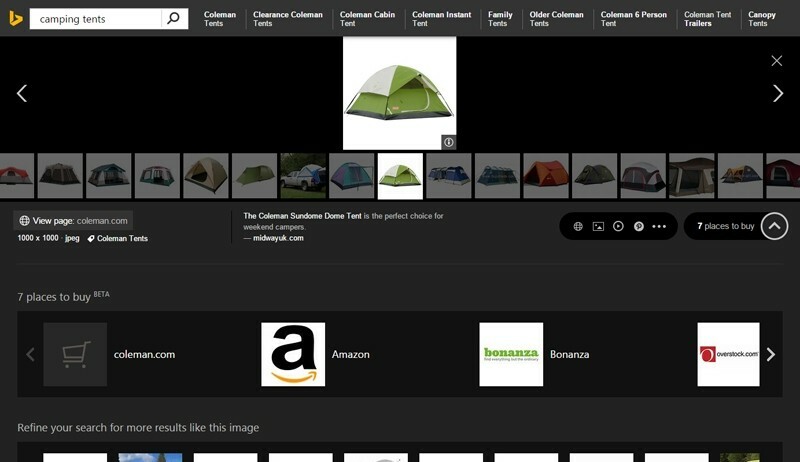 When searching for an item, a camping tent, for example, you’ll see a smattering of camping tent pictures as usual. Click or tap an image and it’ll expand. The new options show up when you scroll down at this point. In this example, the first thing I saw was an option to buy said item. This feature is still in beta so don't expect it to be too reliable right away. Next, you'll see the option to refine the search for more results similar to the image chosen. Keep scrolling and you’ll see Pinterest collections featuring the chosen image followed by what people interested in the image also searched for, different sizes of the image and finally, a list of pages where the image is used. The Bing image search team said as they analyzed how people discover images, talked to customers and studied the different ways we interact with visual information today, they saw an opportunity to put images at the heart of search. Specifically, they noticed that the image may not be the destination but rather, the starting point for something more. The new Bing features will be rolling out worldwide across all platforms over the coming weeks.